In their second adventure (The Disappearing Caterpillar, 2015), Pipsie and her sidekick/best friend, Alfred Z. Turtle, are on a school trip to the park. Equipped with cameras to record each of the “Seven Wonders of Nature!” on their scavenger-hunt list, the pairs head out, determined to be first to find everything. But Pipsie and Alfred’s excitement is dimmed by a lunchnapper. Who is the thief? And will Alfred be able to focus on the mystery over the loud growling of his belly? The duo looks high and low, finding all the items on the list and sprinkling some facts about the animals and signs they encounter along the way. And Alfred’s selfie turns out to reveal the thief as well as capturing their “favorite wonder”—Alfred. The award goes to the twins, though, as team members can’t be scavenger-hunt items. They take the loss well, pleased to make yet another mystery history. Backmatter gives a few more facts about the animals they see. Bishop’s bright illustrations are reminiscent of television cartoons. 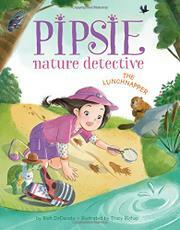 Pipsie and the park ranger are dressed remarkably similarly, and young nature detectives will endeavor to equip themselves as Pipsie does, backpack, nature notebook, and magnifying glass at the ready. Pipsie is Asian, the ranger appears to be African-American, and her classmates are fairly diverse.